The Astros need an intervention. Or maybe something stronger. 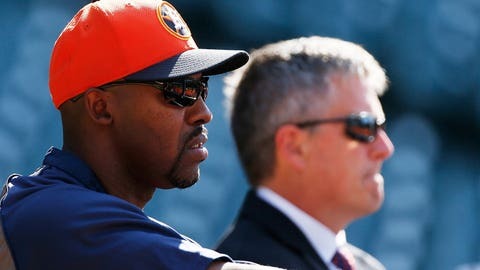 General manager Jeff Luhnow and manager Bo Porter are at odds, according to multiple major-league sources. Porter expressed his frustration with Luhnow to owner Jim Crane in a conversation earlier this month, sources said. Porter’s frustration stems from a lack of input and from his belief that Luhnow engages in excessive second-guessing of his in-game management, sources said. Losing exacerbates tension for every club, but the Astros appear to be dysfunctional on multiple levels. Those critical of Luhnow say that he keeps a small circle, communicating mostly with director of decision sciences Sig Mejdal and others while rarely consulting the team’s on-field staff, executive advisor Nolan Ryan and special assistant to the GM Craig Biggio. The Astros hired Luhnow in December 2011 and Porter in September 2012. The lengths of their respective contracts are not known. Crane could attempt to broker a peace between Luhnow and Porter, and Ryan’s son — Astros president of business operations Reid Ryan — also could play a role in such discussions, sources said. But perhaps it is not a surprise that the emotional Porter and deeply analytical Luhnow are proving to be an uncomfortable fit, raising questions about the team’s future leadership. The Astros, however, are on pace to finish 68-94 — 26 games below .500. Only the Rangers, a team decimated by injuries, own a worse record in the AL. In late June, Sports Illustrated proclaimed the Astros, “Your 2017 World Series champs,” citing the team’s deep collection of young talent, including three straight No. 1 picks in the amateur draft. Since then, the Astros have failed to sign their top 2014 selection, high school left-hander Brady Aiken, creating a firestorm that, according to sources, added to the strain within the organization. The team’s top choice in 2013, Stanford right-hander Mark Appel, also was a subject of controversy, struggling early in the season before showing notable improvement after his promotion to Double-A. An unannounced visit by Appel to Houston prior to his promotion contributed to the friction between Luhnow and Porter, sources said; Luhnow initially did not make Porter aware that Appel would throw a bullpen session for pitching coach Brent Strom. Porter then had to explain the situation to his players, a number of whom were seething, believing that Appel did not warrant his promotion and was receiving special treatment. Appel, after posting a 9.74 ERA in 12 starts for Class-A Lancaster, has produced a 3.15 ERA in six starts for Double-A Corpus Christi. The incident, however, reflected the lack of communication within the Astros’ hierarchy. Rival executives say it is not unusual for a team to summon a prospect for a session with a major-league coach. Porter, though, grew upset because Luhnow did not inform him in advance that Appel would work with Strom. The disagreement over Appel was just one flashpoint between Porter and Luhnow, sources said. The question now is whether their relationship can be salvaged — and whether Crane will want to replace one or both. Crane might resist any change, not wanting to admit that he made a mistake with either hiring. But it’s difficult to imagine the Astros starting the 2015 season with the same management team.